Note: better pictures of cake and cafe will be uploaded as soon as I get home and/or can access a piece of technology that is not my iPhone. Snagging wireless from a could-be-a-scam free harbourfront wifi zone in Copenhagen. The recipient of occasional OCD panic attacks, I decided to create a list of things I wanted to do in each place I was visiting. For all the cities I’ve travelled to so far, my list was always topped by some traditional tourist site – the Eiffel Tower in Paris, the Colosseum in Rome, etc. etc. Basically what I’m trying to say is that, although food recommendations have weighed heavily into my city agendas thus far (especially with Paris and macarons), these places have never been the crowning glory of my to-dos. Vienna, however, was a different story. 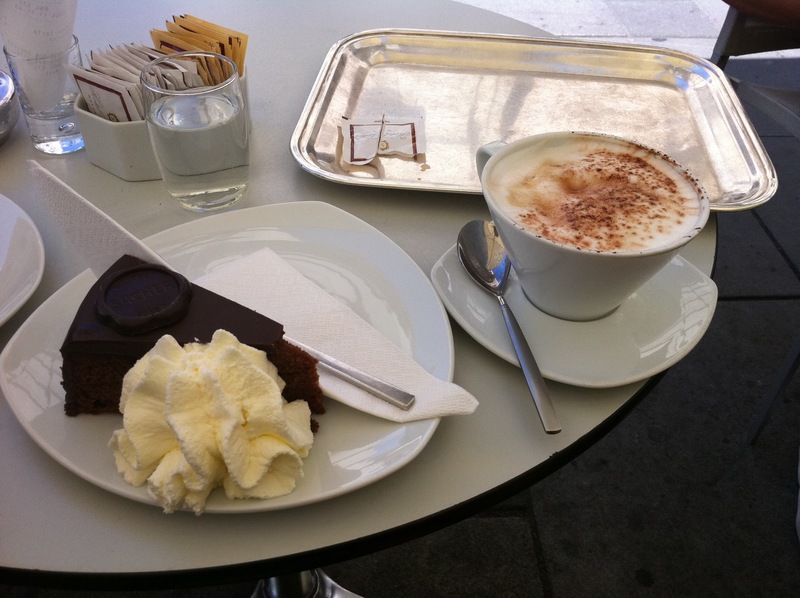 When I started researching what I wanted to do in Austria’s capital city, I stumbled upon a sensational Internet claim: “In Vienna, try the world’s most famous cake,” the websites declared. Well, well, who am I to resist trying such a thing? This famed cake is called the Sachertorte, and is not for those who consider chocolate anything other than their absolute favourite thing. Extensive research told me that the cake was chocolate and, in between the layer of cake and rich top-secret chocolate icing, there was a layer of apricot marmalade. 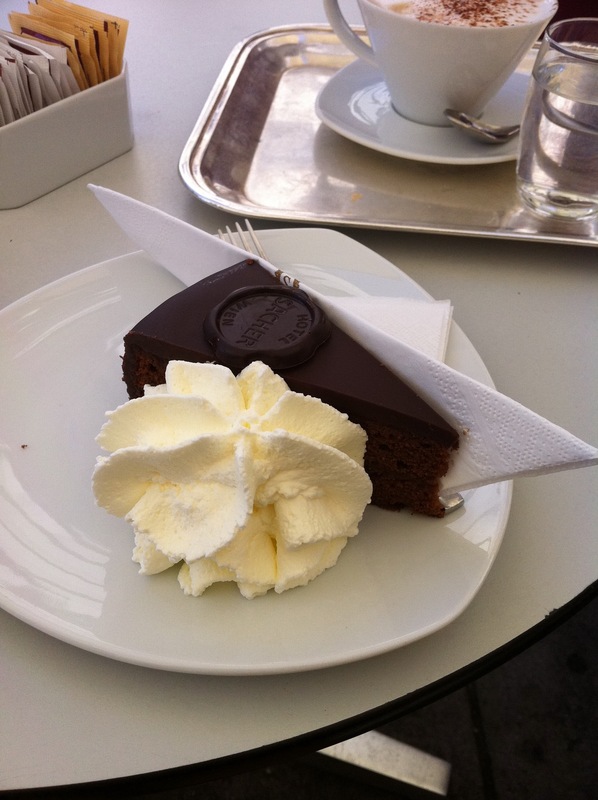 The cake originated as a specialty dessert at the Sacher Hotel, and has since spawned many a knock-off cake. Anyways, at this point it isn’t too hard to guess the location of Gord and I’s first Vienna stop. After an exhausting 12 hour overnight train ride from Florence to Vienna, we decided to fight off our sleepy stupor with a piece of this cake for breakfast. There’s nothing like a chocolate and cappuccino fix to start the day. Thanks to Gord’s masterful navigational skills (minus the time he got us devastatingly lost in Pisa..), we got to the cafe quickly and, before I knew, were presented with a generously-sized piece of cake and mountain of whipped cream. Pictures were taken, cake was admired. Time for the first bite. Gord and I quickly found out that the title of world’s most famous cake is not synonymous with the title of world’s best cake. Maybe the Austrians like their chocolate torte dry (update: the ever-reliable Wikipedia informs me that the whipping cream is served with the cake because the Viennese find it too dry otherwise), but we Canadians found the cake too crumbly for it’s own good. Yes, the top-secret chocolate icing was good (perhaps they keep that part of the recipe a secret because they realize it’s the best part) and the apricot marmalade added another dimension to the dessert, but the cake was the make-it-of-break it factor for me. Thank heavens there was enough whipping cream to smother a small town. Much joyous dipping and spreading occurred. 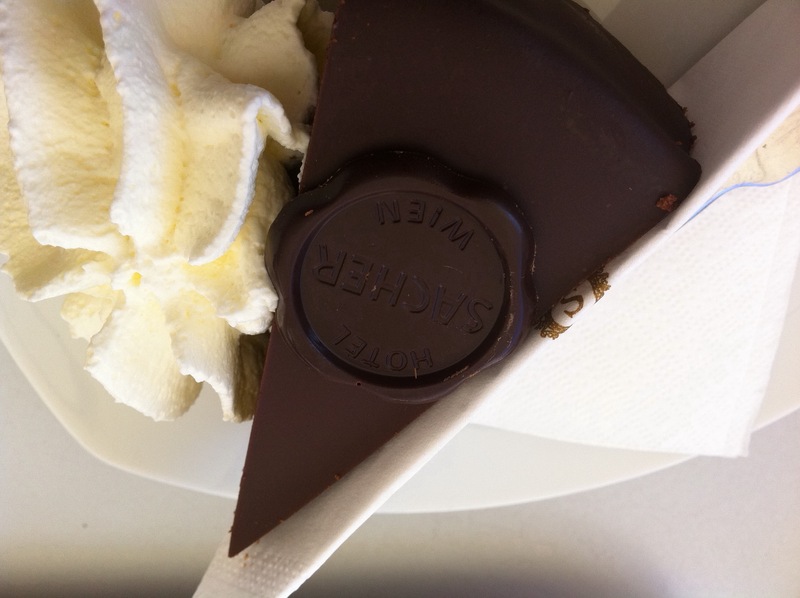 Important note: I had another piece of Sachertorte at the airport today for SCIENTIFIC PURPOSES to see if it would be any more moist. Admittedly, it was a knock-off airport cafe piece, but it was still dry as a bone. Such a shame. Back-at-home goal: recreate Sachertorte using a postcard recipe I bought at the Albertina museum of graphic arts. Concoct a fudgy icing recipe. MAKE CAKE MOIST. Die a happy camper. Must say I was quite underwhelmed when I tried it in Innsbruck a few years ago as well! Thanks for the comment, Ashley! You’ll just have to try making your very own Sachertorte at home sometime – I know I’ll be baking my recreation soon!